Baseball is the national pastime in America. 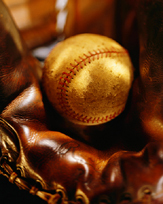 From kids to adults, playing baseball is one of the most enjoyable team sports. But as with other sports, its important that you keep yourself in good condition and have the right equipment to play safely and enjoy the health benefits of the game. Baseball players are advised to condition their entire bodies and be sure to stretch the leg, ankle, and foot muscles before, during, and after play to avoid injuries. Baseball can be characterized by lots of stops and starts, lots of running, and, of course sliding. Practice and technique can enhance your competency and enjoyment of the game, but they are also crucial for building up the muscles needed in baseball. The rapid and changing movements associated with the sport place many pressures on your feet and ankles. Inadequate stretching, improper shoes, and repeated motions lead to the most common foot problems that occur among baseball players, such as Achilles tendonitis, plantar fasciitis, shin splints, stress fractures, ankle sprains, and bone fractures. As with most athletic shoes, comfort is the most important element in choosing the right baseball shoe for you. Look for shoes with a roomy toe box that give your toes enough room to wiggle. The widest part of your foot should fit comfortably into the shoe without stretching the upper. Look for a snug heel to help keep your foot stable. Most importantly, remember to replace your baseball shoes after 70 to 75 hours of active wear. For league play, cleats may be recommended to give you the traction needed for the surface in the diamond. Baseball cleats come in a variety of materials ranging from leather and synthetic materials (plastics) to rubber and metal. Be sure to follow the regulations of your league regarding the material allowed; many leagues no longer permit the use of metal spikes or cleats, particularly on artificial turf. Be sure to give yourself time to adjust to cleats by wearing them on the designated surface.